Outwell tent and awning lighting options offer versatile solutions to banishing the dark, adding atmosphere as well as convenience and safety. With innovative designs and features for flexible use on site,there’s plenty of choice to suit all expectations. For larger tents, go for the Outwell Coxa 3.0. 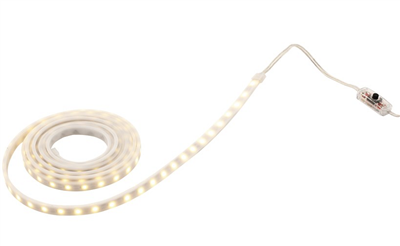 This energy efficient LED strip light offers 3m of waterproof lighting, which can be used inside or outside the tent. The dimmer switch lets you set it to a nightlight while you’re sleeping, which is great for kids. The 5m cable gives you plenty of length to run it wherever you want in the tent and it comes with a 230V plug and USB. With mains power so readily available on campsites, the expanded offer of Outwell Pumps, Electrics and Lanterns extends the convenience, safety and comfort expected by family campers. Bringing power neatly inside tents and awnings, our EHU power cable options are fully compliant with safety legislation with ease of use a clear priority. New for 2019 is the manual Dual Action Tent Pump, including a pressure gauge, a user-friendly ergonomic foot brace and handle grip. Our new UK Drive Away Electric Hook-ups can be connected to a Roller Kit and then to a vehicle. Adding instant, safe warmth for all the family, our new UK Heaters are bound to be a big hit. The all-new Outwell Fans and Floor Air Conditioning options offer reliable, safe, high performance solutions to overheating and cooling. LED illumination is updated throughout for 2019 complemented by new USB-powered Bulb Lights and new Strip Light options. New powerful Carnelian models in Outwell Lanterns offer sturdy options with innovative features for mobile use.